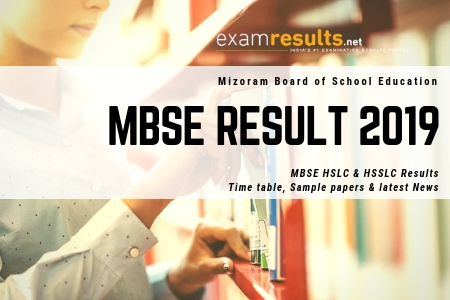 Mizoram Board Result 2019, MBSE HSSLC/HSLC Result 2019. April 09, 2019: The MBSE officially conducts the High School Leaving Certificate (HSLC) Class 10 exams during the month of March. The HSLC exams will commence on the 28th February and continue up to the 16th of March, 2019 for this academic year. This year, MBSE result 2019 is expected to be announced in May, 2019. Students awaiting MBSE HSLC result are advised to keep visiting this page for regular updates. The MBSE officially conducts the Higher Secondary School Leaving Certificate (HSSLC) Class 12 exams during the month of March. MBSE HSSLC Result 2019 is usually announced at a separate time than that of MBSE HSLC result. This year the MBSE HSSLC exams commence on the 5th of March and continue up to the 29th of March, 2019. MBSE HSSLC Result 2019 will be displayed as soon as they are announced, so keep visiting this website for regular updates. Also regular updates on MBSE Class 10 results, MBSE Class 12 results, MBSE Class 10 Time Table 2019, and MBSE Class 12 Time Table 2019 will be available. Type the desired state name, in this case -http://www.examresults.net/mizoram/. Look for the link which says MBSE HSLC Result/MBSE HSSLC Result 2019. Click on the link and fill up all the details to get your MBSE result 2019. Where Else To Check MBSE Exam Result 2019? The Mizoram Board of School Education (abbreviated as MBSE) is a board of school education in the state of Mizoram, India. It is an autonomous governmental body which is responsible for academic administration in the state of Mizoram, India, having its dominion from elementary to higher secondary education. It was established by the Government of Mizoram in 1975 by the Mizoram Board of School Education Act. The board supervises, organises, controls, regulates and looks after the matters associated with school education in the state of Mizoram. The principal function of the board is to prepare academic programmes and organise examination for the High School Leaving Certificate (HSLC) and Higher Secondary School Leaving Certificate (HSSLC).